There is a river in the ocean. In the severest droughts it never fails, and in the mightiest floods it never overflows. Its banks and its bottoms are of cold water, while its currents are warm. The Gulf of Mexico is its fountain and its mouth is in the Arctic Seas. It is the Gulf Stream. There is in the world no other such majestic flow of waters. Its current is more rapid than the Mississippi or the Amazon. 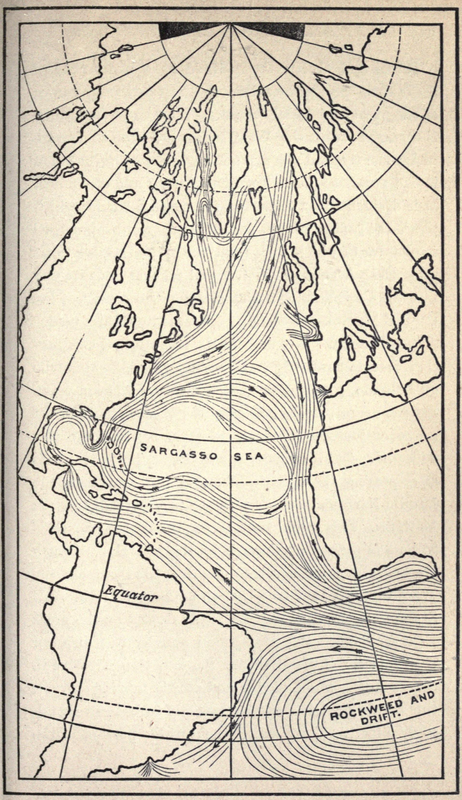 Below is a map of the Gulf Stream presented in Light science for leisure hours. A series of familiar esays on scientific subjects, natural phenomena, &c., &c (1871) by Richard Proctor (HERE).The map is an isographic projection.